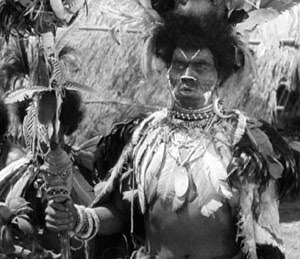 “Meanwhile, the light-skinned Noble Johnson (April 18, 1881 – Jan. 9, 1978) was heavily made up for his role as the village chief [in 1933's, KING KONG]—he was a leading black actor of the era (known as “America’s premiere Afro-American screen star” in the black press) and therefore worth the extra consideration. Johnson, an ex-cowboy, horse trainer, and boxer, had quite a resume before portraying the Chief of Skull Island. He was a student of all aspects of movie making from directing to distribution, and instrumental in the 1916 formation of the Lincoln Motion Picture Company, created to produce what were called “race movies.” Johnson left the company after it had released three films, rumored to have been “encouraged” by Universal to do so or lose any opportunity for parts at the bigger studio.